No matter how prepared and put-together you think you are, trust us, your wedding will probably be a complete blur. But not to worry; you won’t miss out on those amazing moments, personal details and deep emotions, as long as you have a fantastic photographer (or two). Southeastern Wisconsinites are lucky to have many talented shutterbugs to choose from, but that means it’s time to do a little research. Click the links in our list below to browse local photographers’ online portfolios, and see whose styles mesh best with yours. Then, meet with the finalists and get to know them. While the photographer you select is capturing some of the most intimate moments of your life, you want to be sure you’re comfortable with your choice. You can thank us later, when you’re flipping through that breathtaking album. Note: The contents of this guide were checked for accuracy when this article was updated on April 15, 2013 at 8:16 a.m. We continually update the articles on WedInMilwaukee.com, but it’s possible some details, specials and offers may have changed. As always, we recommend you call first if you have specific questions for the businesses mentioned in the guide. Special Feature: Artistic. Passionate. Authentic. Special Feature: Fine art style photography customized for each couple – travels worldwide. 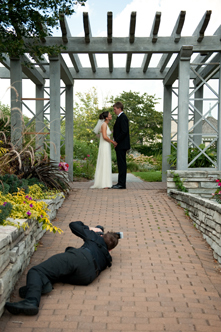 Special feature: We’re a husband & wife team capturing natural, fun and in the moment photography and cinematography. Special Feature: Includes photo booth options and videography. Did we miss a local photographer? Let us know in a comment below, or email us!